In April the Sampler Guild of the Rockies had their workshop. 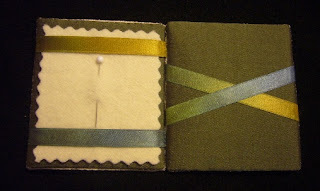 Ellen Chester of With My Needle taught us three classes (information can be found here). 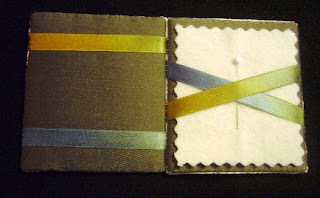 I only took two classes Long May She Wave which I showed you the finish finish of here, and mentioned the other class I took – A Sampler Needlebook. Well I finish finished the Needlebook. It was designed especially for our Guild’s 20th Anniversary. It is very pretty and was fun to make. Ellen’s instructions are very good, including the finishing instructions. She was a wonderful teacher and I would recommend a class from her if you have the chance. It is made with a double hinge so you can open it from the left or from the right. I am calling the Needles the front and the sampler the back. Here it is opened from the right followed by a photo of it opened from the left. It’s magic how the needle page switches sides!! A very cool Jacob ’s ladder configuration. In class we made a mock up of it to help us practice and get ready for the stitched pieces. Good thing because I don’t want all that handling of my stitching! I let folks see the stitching and then play with my mock up! The photos of the stitched pieces have been reduced in size at the request of the designer in an attempt to prevent copy right infringement. So I am respecting her request - too bad she has to ask us to do that. 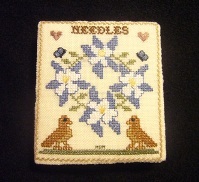 How much fun to see your needlebook! You certainly did a great job not only with the stitching but also with the finishing. I love all of your sayings that you post on your Blog. I also love your stitching too. I would love for you to be a follower of my Blog as well. Fortune Cookie Friday -Yes or No?